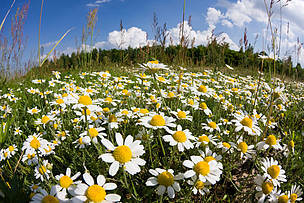 Meadow with flowering corn camomile (Anthemis arvensis) East Slovakia, Europe. In this report, member organisations from BirdLife Europe, WWF, European Environmental Bureau (EEB) and Friends of the Earth Europe have joined their expert opinions to score Member States on the current implementation of different aspects of the Nature Directives. 18 Member States were assessed: Austria, Belgium, Bulgaria, Croatia, Cyprus, Denmark, Finland, Greece, Hungary, Ireland, Italy, Latvia, Luxembourg, the Netherlands, Portugal, Romania, Sweden, and the United Kingdom. Scores were given on 11 implementation criteria of the Birds and Habitats Directives, namely on their transposition into Member State legislation, Member State designation of Natura 2000 sites, the presence of management plans and whether they are put into practice, and the availability of funding and resources to put them into practice. Member States were scored on how well they ensure species protection, on their implementation of appropriate assessments, their management of invasive alien species and on the connectivity of the national network of protected areas. They also looked at how Member States are monitoring their habitats and species of Community importance, how they are encouraging research and scientific work on species and habitats, and how they engage stakeholders and ensure public participation in these processes. The report shows that while the majority of the Member States assessed (67%) have fully incorporated the Birds and Habitat Directives into national law, they have failed to implement them properly. This means EU protected wildlife and habitats are not receiving the protection they need and have been promised. However, with sufficient resources, commitment and willingness to learn from each other, full and effective implementation of the Directives is achievable. Ambition on the side of Member States and the Commission is needed to ensure best practice examples can become the norm across the EU, yielding the much needed results that will ensure Europe’s unique natural heritage is preserved for the generation to come.